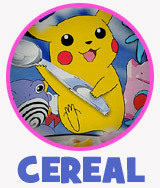 Pokemon Food Extravaganza! | Dinosaur Dracula! Here’s a four-part Pokemon history lesson, using EXPIRED FOOD as our guide! 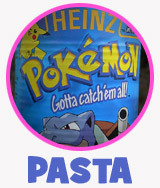 Pick your poison, and learn more about the things Pokemon fans ate over a dozen years ago! 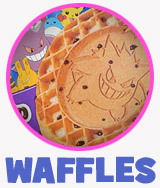 While still a casual Pokemon fan today, my “crazy period” was exactly when these foods were being released. Even back then, societal laws dictated that I was too old for Pokemon. I ignored those laws, but I have to admit, I was pretty jealous of the kids who had this absolute monster of a franchise to obsess about. I grew up on a diet of Star Wars and Ninja Turtles, but just going by the sheer volume and variety of stuff, Pokemon was an entirely different beast. These foods come from its arguably hottest period. If you were going to pick something to freak out over, Pokemon sure looked like a fun choice. These could not have been more perfect. Created in part as an early promotion for Pokemon: The Movie 2000, they came in the sort of box that grabbed you and held you and never let you go. Seriously, just look at that box. It’s artful. And there’s a picture of free falling Pikachu on it. The featured Pokemon are Pikachu, Charmander, Poliwrath and Chansey. That’s… a pretty random assortment. I’m not sure how they came up with that. So we’ve established that the box was obnoxiously attractive. It sounds impossible, but the Pop-Tarts themselves were even better looking. Even allowing for the phenomena of food never looking as good in person as it does on the box, the kids of 2000 must’ve blown fuses deciding between eating these and using them as inspiration for still life paintings. 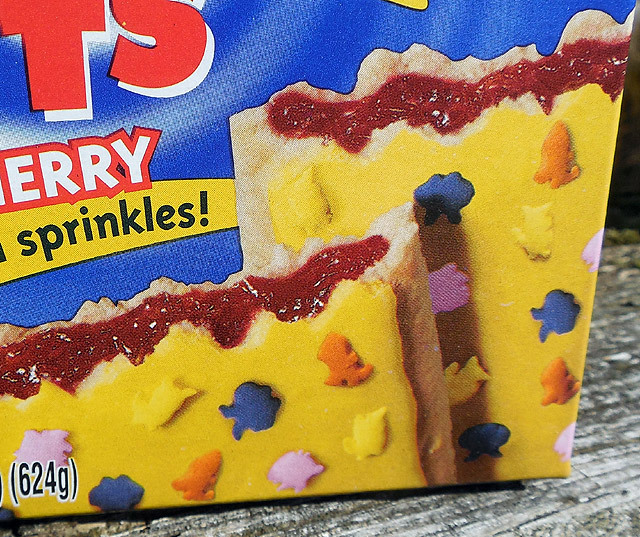 Notice how the different sprinkles match up with the Pokemon from the box? It’s one thing to pluck such an oddball quartet when you’re just filling space on the box art, but to take those characters and actually make candy sprinkles of them? This was big time. Poliwrath sprinkles were big time. 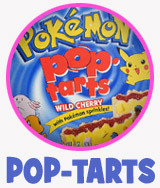 Trivia: Pokemon Pop-Tarts very possibly debuted during the same exact week as X-Entertainment. Know what doesn’t make me feel young? That. 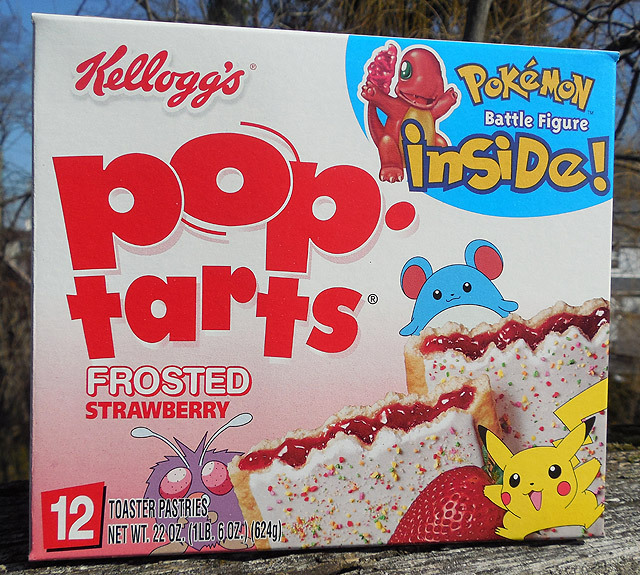 Just a few months later, Kellogg’s again teamed Pop-Tarts with Pokemon by stuffing “battle figures” into boxes of their more “normal” flavors. It was a brilliant scheme. Specific figures were restricted to specific Pop-Tarts flavors, so kids obsessed with completing their set basically had to eat every goddamned Pop-Tart on the market. I’m exaggerating, but there’s still little doubt that Kellogg’s used the figures to transform thousands of children into Pop-Tart addicts. – The Charmander figure could only be found in boxes of Strawberry Pop-Tarts. 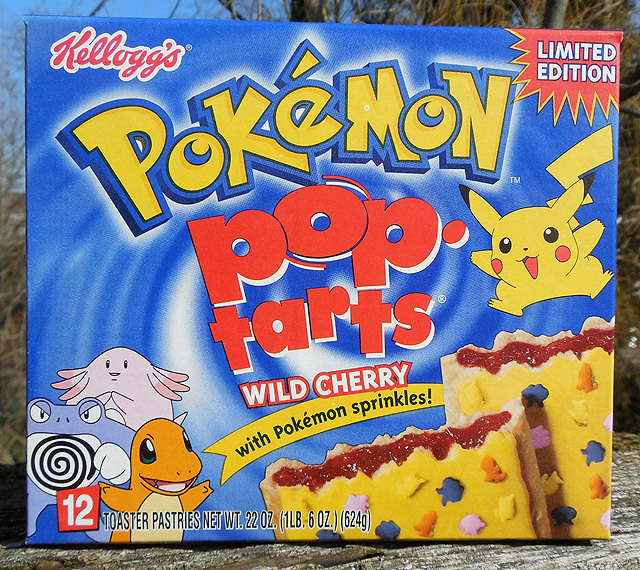 – Poliwrath was limited to Frosted Brown Sugar Cinnamon Pop-Tarts. – If you wanted Chansey, you had to plow through twelve S’mores Pop-Tarts. Admittedly, this was easy to do. I believe the figures were pulled from Hasbro’s regular line, so on top of everything else, they weren’t just cheap freebies. These toys had credibility, and a legit retail value. Nobody had to feel bad about eating so many Pop-Tarts. Ultimately, the pastries acted as edible coupons.